If you were at the intersection of SR 438 and Pine Hills Rd. last week, you may have seen an important message: Always. Stop. On. Red. Red-light running is the leading cause of urban crashes, according to the Insurance Institute for Highway Safety. In fact, more than 10,700 people were killed at intersections or in intersection-related traffic collisions between 2001-2013. 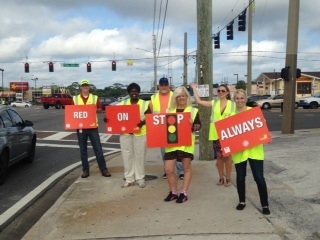 Members of Florida’s Pedestrian and Bicycle Safety Coalition were on streets across the state reminding everyone to Stop on Red, including when making a right turn, as a part of National Stop on Red Week. In an effort to promote the safety of the most vulnerable road users, FDOT organized teams to take to the streets. BFF joined in and got to talk to drivers and hand out educational flyers promoting road safety. Thank you, FDOT, for organizing this great event to help keep our roads safe.